Chris Bowman, a Republican proponent of the Prop L “Restore Transportation Balance” ballot measure, aimed false accusations at the SF Bicycle Coalition and pro-bike SFMTA officials in a panel discussion this week. 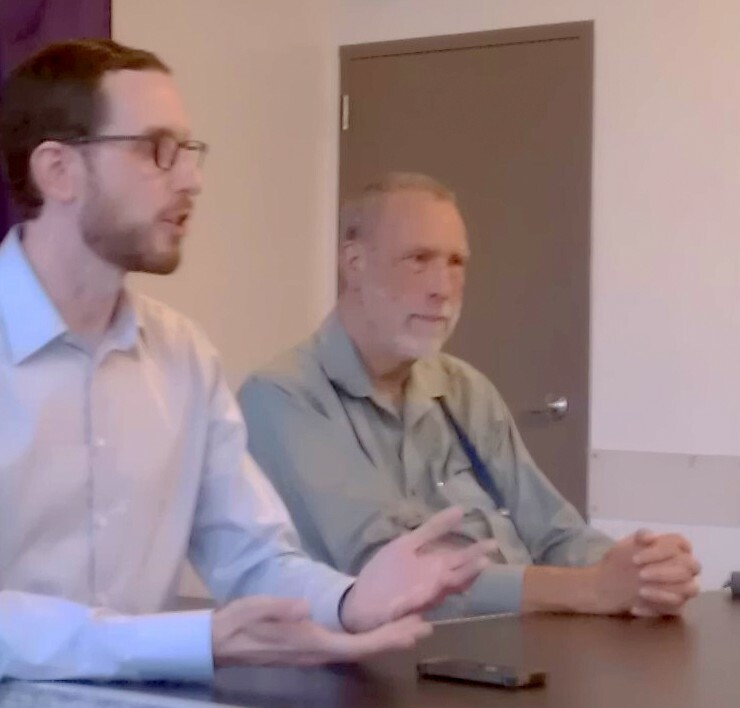 Bowman and Supervisor Scott Wiener were featured at the forum, organized by the Alice B. Toklas LGBT Democratic Club, to discuss Prop L. The proposition claims to promote motorists’ interests, calling to enshrine free parking and build more garages. Prop L is funded by tech billionaire and Mayor Ed Lee backer Sean Parker and the SF Republican Party. Even though nobody else at the meeting brought up the SFBC in discussing Prop L’s implications, Bowman devoted much of his speaking time to attacking bike lanes, and making false claims about the SFBC and SFMTA Vice Chair Cheryl Brinkman. As to where such misconceptions could come from, Shahum noted that the SFBC did hear from individual members, who had urged the organization to launch a boycott through social media posts on Facebook. She said she suspected that those spreading the lie could have misconstrued such messages, although they were written by individuals who don’t speak for the SFBC. Shahum listed four “Dine on Polk” events the SFBC held “with partners, to explicitly promote people to bike to Polk Street businesses and support the local economy.” They were held last October and November as well as this May, at the Crepe House; Bitters, Bock & Rye; and Amsterdam Cafe. Bowman didn’t provide a name, but as we reported in May of last year, former Small Business Commission President Luke O’Brien told SFMTA Director Ed Reiskin that San Francisco needs more parking garages, and that transit-first policies “give rise to this feeling that a way of life is being imposed” upon those who would like to drive. It’s unclear which SFMTA Board meeting Bowman was referring to — there were only two last year where anyone from the public protested the Polk bike lanes. At an August 20 meeting, there were six complaints. At an April 2 meeting, there were just two speakers, including Dawn Trennert, who represents the Middle Polk Neighborhood Association. Meanwhile, roughly a dozen people spoke in favor of protected bike lanes at that meeting. Brinkman’s comments at the April 2 meeting seem to bear the closest resemblance to Bowman’s purported “greedy merchants” comment. Brinkman had been describing her experience at an MPNA meeting she’d attended the month before, where speakers lied about bike lanes being removed, and attendees booed any suggestion that replacing car parking with pedestrian and bicycle amenities might be worthwhile. The misinformation spread by Bowman is par for the course for Prop L’s proponents, who have been caught falsely telling petition signers that Sunday parking meters had not been repealed, and penning an SF Chronicle op-ed rife with misinformation. Prop L’s proponents are expected to continue to speak to more organizations in the coming months to seek their endorsements. The San Francisco Democratic County Central Committee, which includes Supervisors Wiener, David Chiu, Malia Cohen, David Campos, John Avalos, and Eric Mar, as well as Representative Nancy Pelosi and Senator Dianne Feinstein, will consider an endorsement of Prop L tonight. All of those supervisors, except for Cohen, are on the “No on L” campaign’s endorsement list, as is Supervisor Jane Kim. The DCCC meeting will start at 7 p.m. at the State Building at 455 Golden Gate Avenue. Republicans who lie? WHO TOLD? seriously, this thing is a bad joke. As an Advisory Measure it has no power to do anything it claims. It’s just another lie in a series of lies, paid for by Big Tech republicans and their ilk. I wonder how many consultants are making money off this joke? I attended those Polk meetings and was appalled at many merchants and residents’ expressions of contempt for bicyclists as a faceless class of weirdos. Since I was dressed in nice clothes, these haters assumed I did not bike. Surprise! My own private action has been to avoid patronizing or reduce my patronage of all Polk merchants who posted anti-improvement posters. I have replaced them with other stores and restaurants on or beyond Polk and increased my online shopping. Ironically, the only reason I go to Brownie’s Hardware now is to buy SFMTA parking cards. No organization suggested to me to boycott the bike haters, but I find it personally repugnant to provide sales to people who don’t care if I or my children are endangered on our nearest commercial street — Polk. Ballot initiatives are simply about spending enough money to buy the laws you want. There’s no penalty for lying. It wasn’t the SFBC calling for a boycott of Polk merchants, it was Streetsblog commenters. Chris just got his facts a little bit mixed up, which is easy to do, considering how much overlap there is between the two groups. Any other confusion we need to clear up? Who is the Smith person referred to in the article? I can’t find any reference, editing error? Who’s imposing their lifestyle on whom? Sheesh. it’s no joke. and if it gets a serious beat down, the joke will be on them. Leah is taking the high road, but a boycott has been proven time and time again to be the most effective form of politics. Money talk, BS walks. The merchants are by their very nature trying to flex their muscles and foment policy. The only foil to that is to point out to them that if they foment policy that their customers dislike, they will lose customers. Should such merchants stop lobbying the city for bad policy, there will be no need to make it clear to them via the cash register that said lobbying is against the interests of their customers. Charles – I assume since you have a problem with this boycott, you’ll be heading over to Chick-Fil-A and filling your belly? And taking your time machine back to 1980 and buying copious South African products? Maybe you can write Obama and tell him that putting sanctions on Russia is anti-liberty. Generalization alert, but… It’s a lot like compulsive liars thinking everyone else is a compulsive liar. Or crooks justifying criminality by assuming everyone else is a crook. In this particular case, RTB is a symptom of ignoring – or simply being unable to recognize – existing privilege and seeking to defend the status quo against policies that are viewed as anti-common sense. Unfortunately, “common sense” is usually wrong — especially when it hasn’t been updated to account for new scholarship or expanded to include others’ views as well. Bowman knows that Prop L has no chance in hell of passing, so he is just going 100% negative and lying about everyone and everything he can in hopes that this will confuse voters enough to vote for it. ‘…considering how much overlap there is between the two groups…’ The SFBC has ~10K members. There were maybe 10 commenters calling for a boycott. You privy to how many of those 10 are paying members of the SFBC? You gonna take responsibility for all commenters who agree with you, p_chazz? otoh, VM, as I recall, you treated all merchants on Polk as a faceless block and felt too intimidated to ask individual merchants what they really felt. We did, and many were too busy, misinformed, intimidated, etc. to put their heads up in resistance – just like you. A boycott wouldn’t make a dent and any drop in sales, if perceived at all, wouldn’t necessarily be associated with it. If someone makes a claim about an organization that should really only apply to staff and elected board members. Bike coalition members (or those of any organization) are allowed their own opinions and actions, but those shouldn’t be considered an official stance or a reflection of the organization as a whole. Some of you may recall that I’m the founder of Folks for Polk and was involved in the online discussion of boycotts. We’re the ‘partners’ of the SFBC – as well as WalkSF, Vision Zero SF, SFTRU, et al – who host the Pub Talks on Polk that Leah refers to. FFP has worked hard to inform and forge ties with businesses that do want change and there are plenty of them. What you don’t know is that I took the heat for your call for a boycott. A year ago, The bully ringleaders tried to spread that rumour about me. Some merchants would yell at me on the street or in their shops and I was physically threatened. I publicly challenged them at City Hall to go ahead as I was on public record as having offered an alternative, thanks to SFStreetsblog’s archive. Further, I pointed out that their accusations outed them for the liars they are. The rumours stopped. I visited businesses to determine which are our allies and got many to agree to write letters of support, despite the fact that they were rightly fearful of revenge by the bullies. I read one of those letters at the first joint meeting of the Small Business Commission and the MTA Board. Six months ago today, I was cycling and was hit by a driver. My hip was broken and my efforts were curtailed considerably. We certainly could have used help enlisting even more supportive merchants. If we’d had more boots on the ground, this stupid accusation would have been impossible. Maybe more visible solidarity amongst us could even have prevented Prop L from having any legs despite Big Money. Enduring the disgusting behaviour of the bullies has been leavened by great contact with sympathetic merchants and other terrific advocates. FFP continues to forward the best that can be on Polk and yes, there has been progress. But you can’t outsource engagement by hitting ‘Post’ and personally, I’m exhausted from the heavy lifting of trying to save the City from itself. ‘The Merchants’ are only a very few instigators, not All Merchants. and how would you know who they are? I think he meant “The All Powerful Bike Lobby,” not SFBC. Hi M, my hat has always been off to you for your patience and perseverance, your ongoing work for Polk, etc., etc. Therefore, your groundless accusation against me — that I treated all merchants on Polk as a faceless block — I will assume stems from your frustration, not fact. Indeed, it is precisely because I talked and mostly listened to individual merchants that I determined for myself that I could not stomach giving particular shops my many hundreds of dollars per year of business. I will not provide sales for the liquor store at Pine & Polk, the Russian Hill Book Store, Brownie’s, and some others. I enthusiastically patronize Polk Street Produce and many others who refused to post those awful Save Polk Street flyers. Again, I admire your work, but there is room for more than one kind of heartfelt response to discrimination against bicycle riders. Lastly, my deep sympathy and warm wishes for your recovery. I have endured off and on years with a disability and know how hard and depressing sometimes the recovery process can be. Good luck! Easy to start with the ones with the SAVE POLK STREET signs in their windows n’est pas? Or whom are testifying against the improvements? This has all been publicized. From the beginning, I reported publicly that the signs in shop windows never accurately reflected the opinions of the people inside. Never. Not ever. I have no time – and now, zero patience – to delve into the archives and quote some of you but, VM, but you did in fact say you’d be uncomfortable face to face with merchants to explain your pov. As it happens, after he and I spoke and found some common ground, the then-owner of Brownies removed the sign from his window. The handful of specific merchants you cite are just that – a handful. I was saying it then and am repeating now: if just a hundred if us regular customers bothered to openly commiserate with and support sympathetic merchants, things would be quite different now. So what if we had to patronize a different donut shop for a while? So now that we all see that empty gestures, baying for blood or boycotts, does real damage, let’s have no more of that nonsense and more honest activism. Ta for your well-wishes and acknowledgment, VM. I’m almost 100% and so happy to be cycling again, albeit more white-knuckled doing so. As to patience, until someone finds where we mislaid the magic wand that makes the world what we want it to be, patience and empathy, and collaboration, and perseverance by many are what it will take – especially in SF. Regardless, it impacts the opinions of the people *reading* the signs. So the question is, if a well meaning shopkeeper is clueless and causes good projects to die because they make a “mistake” – should I support that bumbling shopkeeper anyway? Additionally, I am less inclined to support shopkeepers who simply want to keep their noses clean. I want to see shopkeepers *actively* pursuing the goals we need. The theory seems to be that merchants hold a lot of sway. If a bunch of reg’lar folks say “we need a bike lane on Polk” and the merchants are silent, there is no push for David Chiu to get himself messy. This might say “You are with us or you are against us” but frankly I have no problem with that. I will proactively seek out and support businesses that actively support the sort of streetscape improvements I think are appropriate, and if a merchant has an opportunity to speak out in that manner and defers, then I have no use for them. The one I belong to is called the Sinister Bike Lobby, but it’s affiliated with the Shadowy International Bike Lobby. Hi M, Great news, I am glad you are almost fully recovered. I understand, based on a streetsblog comment I made, why you thought I did not talk to merchants, but I did do so, later. Why? Because: 1) I got pissed off at myself for being a shrinking violet, and 2) I am better at the one-to-one, than in hostile public meetings, though I am going to do better in the future. Based on those conversations and the posters remaining in some store windows to this day, I decided to avoid certain stores on Polk. Your own work has been great. Mine, probably trifling. But there is no way I will ever put money into the hands of merchants who treat my and others’ safety as unimportant compared to their customers’ street parking convenience. The problem with SIBL is that it seems to have too many different personalities–though that’s probably the fault of the parent organizations. People here were invited to submit their picks for a Preferred Polk Places list. The MTA also asked us which businesses were more approachable. More names would have helped all of us. We got feedback from only a few people, our wonderful, dedicated core. Just contributing the names of merchants you’d vetted would have been a safe, small effort, but also would have been enormously helpful to our goals. OK, disengaging now – from here. Bumbling? Really? You, with nothing at stake, couldn’t find the time or whatevs to take meaningful action on something you profess to care deeply about. The vocal few are easy to dismiss but why do you expect other maxed-out merchants, with possibly their livelihoods at stake, to check each day if someone stuck a poster in a far corner of their windows or to investigate the facts or to find other like-minded merchants who were afraid to be found or to stand up to threats to withhold the liquor licenses they’d applied for…? Those were among the very real scenarios that kept our allies under cover. I do not know anything about the politics about which you all have commented on here, but I would like to submit my thoughts about Polk St. and the initiatives to provide safer biking, with the concomitant loss of parking spaces. I have lived in SF for nearly 40 years and the Polk St. corridor is one of my favorite neighborhoods, because much of it has resisted gentrification, its businesses are mostly composed of small enterprises with a decent diversity of styles and offerings. While I do not bike anymore, I am in favor of safer biking conditions for those who do, and I abhor the increasing traffic year after year and the degradation of our environment (and sanity) by greater congestion. As I wait (too long) for the 19 Polk bus to bring me back to Market St., I sit and observe the interplay of customers with businesses and the patterns of vehicular and pedestrian navigation on the street. I truly believe that merchants are defending parking spaces and opposing bike lanes because many of them and their employees live outside the City or in outer neighborhoods and they want to retain spots in front of their businesses for their own use. In other words, they arrive early in the AM and feed the meters throughout the day. IF this is a widespread practice, then their opposition should be discounted. The way to prove this hypothesis, is to survey each business, determine the home addresses of the working owners/family members/employees and ask them where they park. I really do not believe that everyday workers would be paying to park in the garages. What I do see, is people of all ages walking along Polk–be they long-time residents, seniors, millennials queued up at their neighborhood brunch spot (to which they’ve walked), tourists wending their way eventually to the piers and the Bay and LOCAL residents patronizing their own neighborhood businesses–to which they have WALKED. Sorry to hear about your hip. Has it healed? Did you file a civil suit against the driver? What was the outcome? Do tell, who threatened to withhold liquor licenses? This “civil servant” needs to go to jail, after being fired. Thanks for your concern, Sanfordia113. It happened out-of-state and I decided that the same scenario would have been much less likely here (I had to so I could get back on a bike in SF 😉 There was a police report but, as that is a ‘no-fault’ state, filing against the driver would have just yielded headaches and even more paperwork. The driver had made a stupid decision, in the thrall of what I call ‘The Accelerator Pedal Imperative,’ i.e. Speed is good; I’ve got the power and I’m gonna use it. Here’s the good news: those of us who are fit – like cyclists – recover much more quickly* In a follow-up visit 4 days post-crash, the surgeon asked if I could stand and when I easily did so without using the walker, he laughed. I was puzzled until he explained that I was at the extreme top end of the post-op mobility spectrum, that he almost never sees that, and that I’m physiologically decades younger than my chronologic age. I’ve worked with many cowboy-surgeon types. Most use finely-honed skills and scalpels but otherwise proceed with breathtaking bluntness). His assessment gave me a needed boost then, and I boast about it now because the recuperation period in between was a hell I would not wish on anyone. I’ve been extremely fortunate but far too many are not and reminding myself of that at the lowest points in my efforts to improve mobility in SF, has helped fix my resolve to continue. Sorry, can’t do that. Have called them out (carefully) in the press and in meetings but this isn’t the place to do so. Report it to Dennis Herrara’s office and all supervisors. This sort of corruption is unacceptable and dangerous (if what you allege is true and can be proven). Doubt Ed Lee has the mental capacity to understand the issue. A survey of the business owners specifically was not done, but data was collected on how people get to Polk in General, which showed only 15% arriving by car: http://www.sfmta.com/sites/default/files/projects/PolkIntereptSurveyFindings.pdf. This information still did not convince the opponents of the project that the loss of street parking was justified, and I doubt any amount of data collection would. @p_chazz – It’s pretty interesting how many cowardly anonymous commenters in various Bay Area online media keep making the same assertions, and continue to do so after corrected. That’s not a mixup, it’s a strategy of lying, and it’s done because 1) it’s inflammatory and 2) the truth is not on their side. ≈ The playbook resembles the one we saw in use in NYC, in that all sorts of things were misattributed to various groups, including the now-classic Bike Lobby (“an all-powerful enterprise”). NYC’s Department of Transportation countered with cold hard data, so their version of the No-On-L crowd just had to gibber about how the data was made up, DoT was lying, Janette Sadik-Khan had bike advocates on speed dial, etc. etc. Seems to me that SFMTA ought to be getting the cold hard data out there. We should also listen to our Golden Wheel Award keynote speakers more. This year, Aaron Naparstek gave a great presentation on the backlash (the #bikelash if you’re on Twitter) in NYC, and what we learned from it. Sadik-Khan was here last year and showed how effective a data-driven approach can be. It was just a joke. Take it in the spirit in which it was intended. Considering how many jokes you guys make at the expense of Rob Anderson, you are pretty thin skinned when you are the subject. PS For the record I am opposed to Prop L so I am not part of some vast conspiracy. Suggest you take off your tin foil hat.